James Butler Hickock was known across the frontier as a soldier, Union spy, scout, lawman, gunfighter, gambler, showman, and actor. He crossed paths with General Custer and Buffalo Bill Cody, as well as Ben Thompson and other young toughs gunning for the sheriff with the quickest draw west of the Mississippi. 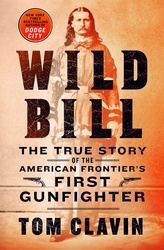 Even before his death, Wild Bill became a legend, with wildly fictional accounts sometimes supplanting fact in the name of a good story. And his legend has only grown since his death in 1876, when cowardly Jack McCall famously put a bullet through the back of his head during a card game. Bestselling author Tom Clavin has sifted through years of western lore to bring Hickock fully to life in this rip-roaring, spellbinding true story.